Looking to plant the common Hass variety of avocado in your yard? Looking for the less common Reed? Searching for where to buy a rarely grown avocado variety like Nabal, GEM, or Jan Boyce? Let me try to connect you with the grower or seller of the avocado variety of your choice. Most retail nurseries throughout California don’t grow the avocado trees that they sell. 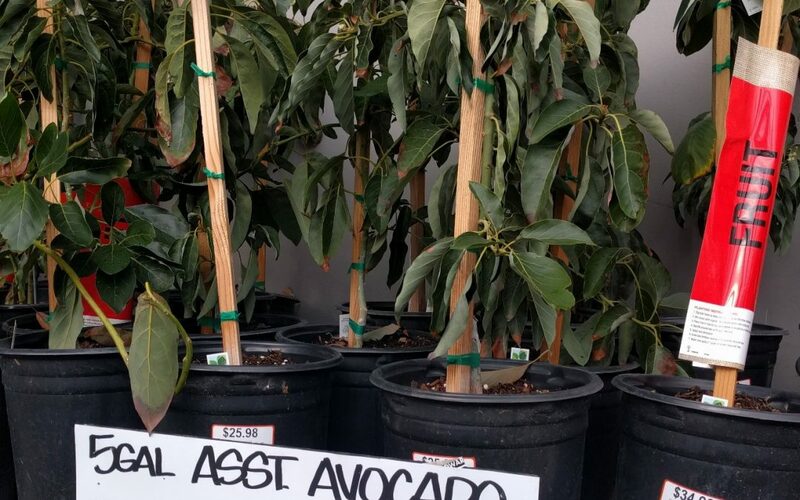 Rather, they get their avocado trees from wholesale growers, especially La Verne Nursery in Ventura County and Durling Nursery in San Diego County. Between these two, about a dozen avocado varieties are made available to hundreds of retail outlets: Bacon, Fuerte, Hass, Holiday, Jim Bacon, Lamb Hass, Little Cado (also known as Wertz, Wurtz, Hybrid Dwarf), Mexicola, Mexicola Grande, Stuart (also known as Stewart), Pinkerton, Reed, and Zutano. Another way of locating a retail outlet through which to buy a La Verne-grown avocado tree is through their website. Click here to go to La Verne’s store locator webpage if you don’t have one of the above mentioned stores near you. 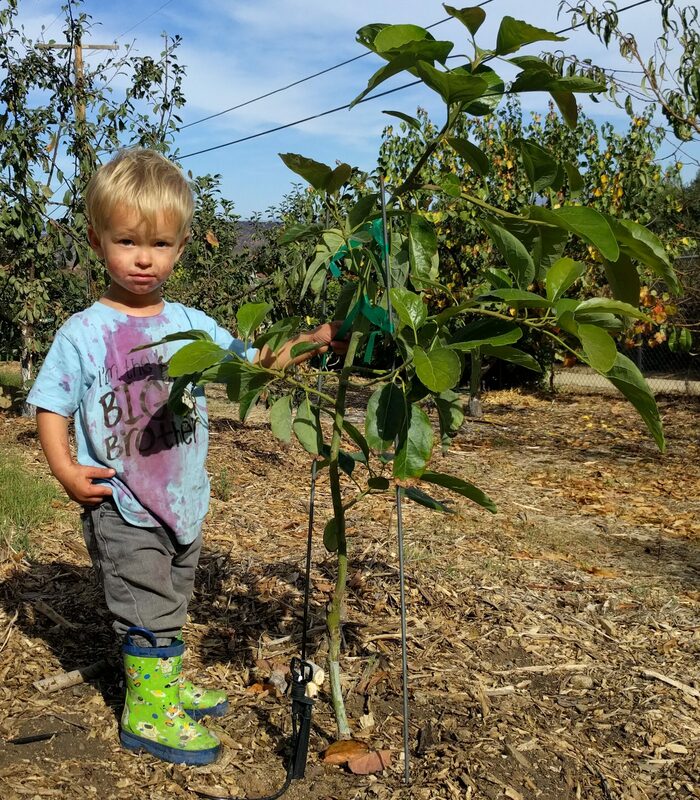 You’ll likely find a smaller, independent nursery near you who sells La Verne avocado trees. For example, in San Diego County, we have the independent Walter Andersen Nursery with two locations. One is down near Point Loma and the other is up in Poway. They usually have a good selection of avocado trees on hand, coming mostly from La Verne and Durling. By the way, if your local nursery doesn’t have one of the above avocado varieties in stock at any one time, they can almost certainly request it from the wholesale grower (Durling or La Verne or elsewhere) and get it for you within a couple months — sometimes longer. Just ask. Over the years, I have bought avocado trees from all of the outlets mentioned above, and I can vouch for their quality generally. This Hass avocado tree was grown by La Verne Nursery and bought at Walter Andersen Nursery in Poway in 2013. In Orange County, a good source of avocado trees is Laguna Hills Nursery. Their trees come from a wholesale grower called Brokaw. 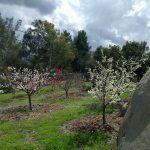 Depending on the time of year, Laguna Hills will have different size trees available and many varieties, such as Hass, Lamb, Reed, Holiday, and Hass Carmen. Maddock Nursery in Fallbrook is one final place that I’ll mention where you can find the most common varieties. The distinction of Maddock is that they grow their own trees. They have been doing so forever and they do it very well. To find uncommon varieties of avocado trees for sale you must visit smaller, sometimes peculiar, places. In the avocado epicenter of Fallbrook, you find Atkins Nursery. 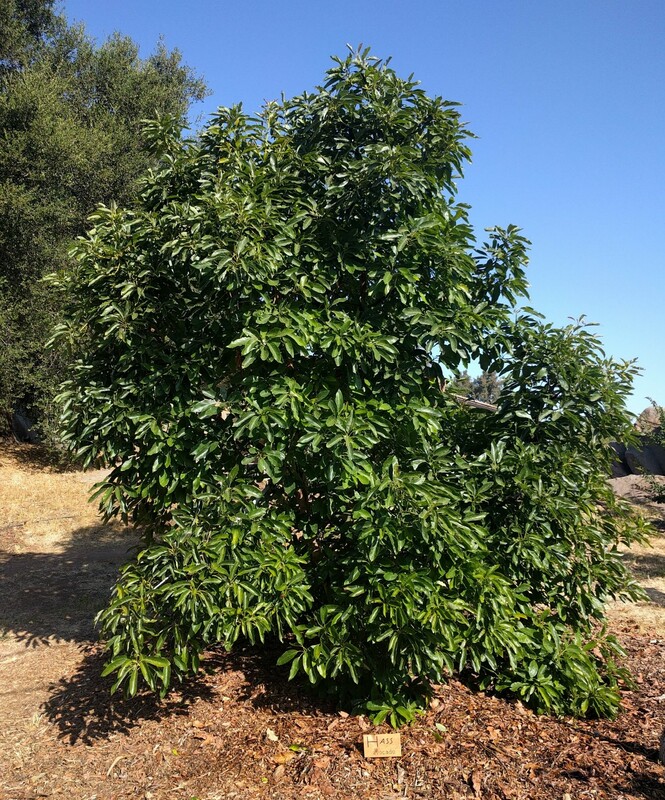 Established by Oliver Atkins, who long served as the chairman of the California Avocado Society’s Variety Committee, the nursery is now owned and run by Victor Gonzales, but propagating rare avocado varieties continues. 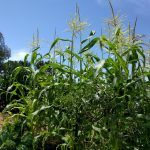 They are truly one of a kind, offering varieties found at almost no other retail nursery, varieties such as Sharwil, Nabal, Gwen, Nimlioh, Queen, Ardith, and on and on. This Sharwil avocado tree was bought at Atkins Nursery. The pomegranate juice on my son’s shirt was not. Atkins doesn’t have a website, but they do have a Facebook page. The nursery’s address: 3129 Reche Rd, Fallbrook, CA 92028. Their phone number: (760) 728-1610. Not far from Atkins (and Maddock) in Fallbrook is Subtropica Nurseries. 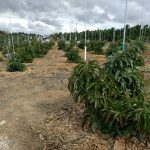 This is an operation that supplies farmers with orders of thousands of trees but also sells to home gardeners, and here you can buy avocado varieties that aren’t widely available, such as GEM, SirPrize, Hellen, and Hass Carmen. Beautiful roots on this Hass Carmen that I bought from Subtropica Nurseries. If you’d like to buy a tree from Subtropica, the manager, Eli Hofshi, asks that home gardeners contact him through the website (linked above), letting him know which variety you’re interested in so he can locate it and move it over to Eli’s Farm Stand across the street for payment and pick up. One other place where you can buy rare avocado varieties only pops up once a year, in April (a good time to plant a new avocado tree). 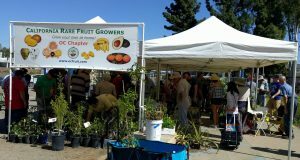 The great people of the California Rare Fruit Growers Orange County chapter have a booth at the Green Scene at the Fullerton Arboretum where they sell small avocado trees they have propagated themselves. CRFG booth at Green Scene, 2018. There you might be able to talk to the very person who grew the tree you want to buy. That tree may have been grafted by Julie Frink, for example, who probably knows as much about avocado varieties as anyone else in the world today. In 2002, Frink was given the Oliver Atkins award (yes, that Oliver Atkins) by the California Avocado Society for her work researching avocado varieties. Varieties I’ve seen available at Green Scene and almost nowhere else include: John Herd, Daily 11, Kahaluu, Choquette, Jan Boyce, Esther, Linda, Shindler, and Edranol. Especially if you live outside of Southern California or don’t have a good retail nursery nearby, consider buying an avocado tree online to be shipped to your front door. The only such vendor that I have used and that I can recommend is Four Winds Growers. 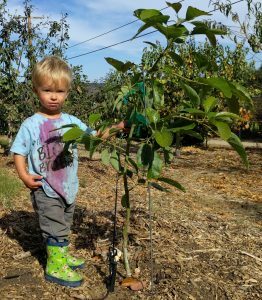 Four Winds is located in Northern California but they purchase the young avocado trees that they’ll eventually sell to you from Brokaw Nursery — the same Brokaw whose trees are sold at Laguna Hills Nursery in Orange County. Four Winds offers more than a dozen, excellent avocado varieties for sale through their website (linked above). One small note: Don’t be misled by the photos of avocado fruit on the Four Winds website as — at the time of this update (April 2019) — some are not those of the variety name listed below them. For example, a photo of Hass fruit is shown above the Stewart variety name. 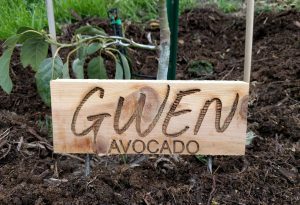 I hope this information connects you to someone who has grown the avocado tree that you want to plant in your yard. 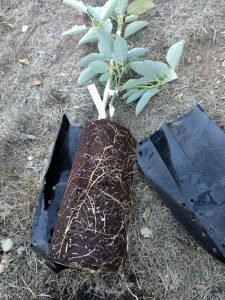 Once you have your tree, have a look at my posts about planting and watering new avocado trees. I just bought a 24 ” pot lamb hass and also wurtz n both, have fruits already can I leave them in their pot? Can you leave the trees in their pots? Sure. 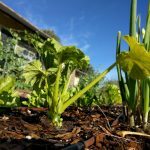 But they’ll be easier to care for and grow and produce faster in the ground. Can you leave the fruit on the trees? Sure. Avocado trees usually regulate themselves well and won’t hold more fruit than they can handle, especially if staked up. Do you have a Jan Boyce in your collection? I do have a Jan Boyce, but it’s young and has yet to fruit. I’m working on it. At this time, I don’t know of anywhere in Los Angeles or elsewhere in Southern California where you can certainly, reliably buy a GEM avocado tree. But I’ll keep talking to people and update this comment in a few days. The main problem is that GEM is a patented variety that can’t be propagated by anyone and everyone. Update: GEM avocado trees are now available to home growers at Subtropica Nurseries in Fallbrook, San Diego County. Please see the body of the post above for details on visiting Subtropica/Eli’s Farm Stand and getting a GEM or one of their other excellent avocado trees. I’m working on this. Please see my answer to Peru above. Anybody in Southern California sell Multi grafted Avocado trees? i have limited yard space and would like a tree with two or more verities/seasons to the fruiting. I have seen multi-grafted avocado trees from time to time at a few nurseries. I can’t recall for sure all of the places, but one was Walter Andersen’s in Poway, San Diego County. Usually, any retail nursery can attempt to special order such a tree from a wholesale grower such as LaVerne or Durling. You might also consider going the route of planting two or three individual trees very close together. One huge advantage of planting multiple trees a foot or two apart rather than a single multi-graft tree is that you can choose the varieties. Alan, I also live in SoCal. I just recently grafted fuerte and bacon on my hass, I also have a lamb hass and a Mexicola Grande. If you live in ventura county message me. I’ve got a Fuerte that I grafted Hass and Reed to, but I don’t sell trees. Your best bet would be Armstrong. They are good about ordering trees. Give them a call. I bought my Reed tree at Walter Andersen about 4 years ago – they might be able to order it for you also. I appreciate the helpfulness of your site, but before I start adding trees of any variety, I need to resolve an issue with my current tree. I am in Simi Valley and have a beautiful 12 yo Fuerte avocado tree. It blossoms heavily each year and I’ve seen a lot of bees working very hard on it. Then it drops every flower and has only given me one avocado in the last three years. There are lots of other avocado trees within a quarter mile of here, but have room to plant other varieties that may complement it. Not sure if there’s something more I can do or just cut it down and start over. Oh, the fatal flaw of the Fuerte. This bearing problem has flummoxed and frustrated growers for a hundred years now. It has been seen in some studies that Fuerte trees increase fruit yield when planted close to A-type trees, so you might try that. For my own Fuerte tree I’ve chosen Pinkerton and Lamb and Hass as pollenizers. Pinkerton especially seems like a good pollenizer since, in my yard anyway, I’ve noticed that they flower at mostly the same time. Any A-type avocado will help though. That being said, many people have observed that some Fuerte trees just seem to be duds. They never bear much fruit. In contrast, some Fuerte trees consistently bear a good amount of fruit even though they’re not near any A-type avocado trees. I’ve noticed this in some Fuerte trees that I’ve watched closely over the years in different locations. It’s a mystery to me. If your tree is healthy, and you don’t need its space (both of which seem like your case), you might plant an A type nearby and give it a couple years to bloom and have a pollenizing effect. If still no fruit, cut down the Fuerte. As for which A-type tree, I’d choose Lamb if you can only have one since the bloom time will somewhat overlap plus the Lamb’s harvest season is a good complement to the Fuerte’s (Pinkerton’s harvest season is almost the same as Fuerte). My second choice would be Hass. Sounds like advice I can live with. I’ll try adding a couple varieties (probably Lamb and Hass based on your recs) and may play around with Herman’s grafting suggestion for the Pinkerton on the Fuerte itself. Greg gave you good advice. Here is my experience. In 2003 I planted a Hass and Fuerte close together in my yard. Being afraid of over watering I didn’t give the Hass enough water and it died. 2 years later my neighbor brought in soil and planted 2 Fuerte trees on common area. He died in 2011 and his wife didn’t want to care for the trees, so I got a common area license and took them over. My Fuerte tree produced a couple a year and was not doing well, so I grafted Hass and Reed to it and now it has many cados on it. The trunk of the Neighbors trees are 6″ dia. or more. As Greg stated some do better. One tree produced about 10 to 20 a year and the other was really pathetic. Then a few years ago the better tree was loaded and was pulling out of the ground since it was growing towards the sun down hill. I cut the trunk down to about 6′ high and grafted Hass to it. I also grafted Hass to the other Fuerte large tree. This year the poor performer had about 100 large Fuerte and the Hass has probably 150 cados. When you graft to a large healthy tree the grafts grow fast and big in size. I’m inland from the coast about 12 miles near SDSU. The neighbor who planted the Fuerte had lived in El Cajon and had many Fuerte trees that did very well there – it is a hotter climate. I hope that helps. Thanks for that contribution, Richard. Good to hear that you’ve seen positive results from grafting in Hass and Reed onto those Fuerte trees. I forgot to mention in my comment below – sprinkle epsom salts around the base of the tree and water it in. Also, as Greg stated, wood chip mulch – a nice thick layer. Rick, Add iron as a fertilizer and put a cap of mulch around the base of the tree. I would suggest grafting an a type avocado like a hass, lamb hass or Pinkerton. I live in the Oxnard area and enjoy grafting let me know if you need help grafting in the spring time. Thanks for the suggestions. I’ll give them a try. I’ve done a little grafting in the past, so will do that too. Thanks for the offer of your help. I’ll let you know if I run into trouble. Hi ,this is Hyvens from South Florida do you know any online retailers that could ship to Florida? I think Four Winds Growers ships avocado trees to Florida (they just don’t ship citrus to Florida).